Mooncakes are a common sight in the atriums of malls, office pantries, and at social gatherings during the Mid-Autumn Fesival. 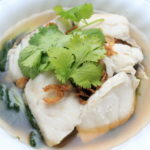 Coming in an ever-increasing variety of tempting tastes and flavours, you may find it hard to resist this calorie-dense, sugar- and fat-laden treat. Is it really possible to enjoy mooncakes without guilt, when an average-sized mooncake contains a whopping 1000 calories? Well, the tradition occurs only once a year, and it would be terrible to miss out. So here are some things you may want to consider to keep your blood glucose levels in control and still enjoy yourself. Baked, Snowskin or Flaky crust? Mooncakes are typically made of pastry wrapped around a paste. In Singapore, you will commonly find baked, snowskin, or flaky crust pastries. But apart from their varied tastes and textures, do their nutrition profiles differ? Snowskin mooncakes may be generally perceived as healthier but are not necessarily healthier than baked ones. They can contain more sugar depending on how much icing sugar is used to make the skin. They may also have just as much fat, often in the form of vegetable shortening. 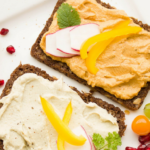 Vegetable shortening may contain trans fats, a type of unsaturated fat which in an intake-dependent way, has been shown to be linked to an increased risk of heart disease. Flaky crust mooncakes, such as the Teochew-style Orh Nee (yam paste) flaky crust mooncake, are made with oily dough (lumps of vegetable shortening mixed into the dough), or by rolling alternate layers of oily dough and flour that have been stir-fried in oil. Depending on their size, flaky crust mooncakes may thus contain more fat. 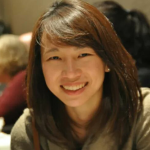 So, How Much Mooncake Can I Eat? 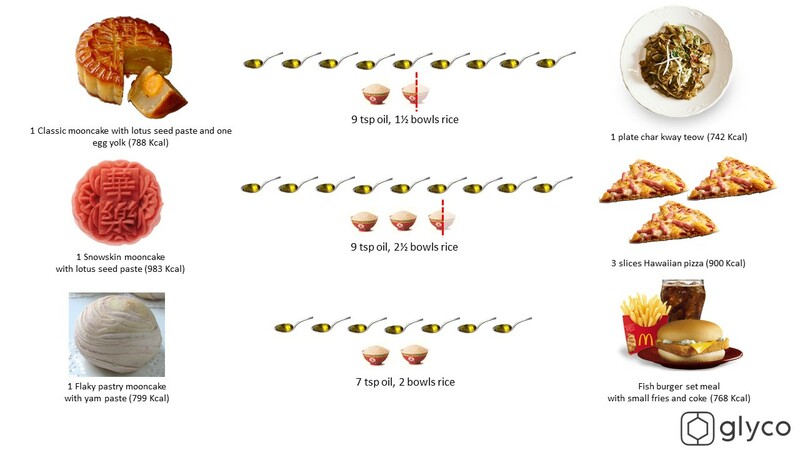 Portion control is key to prevent excess calorie intake and to keep your blood sugars in check. 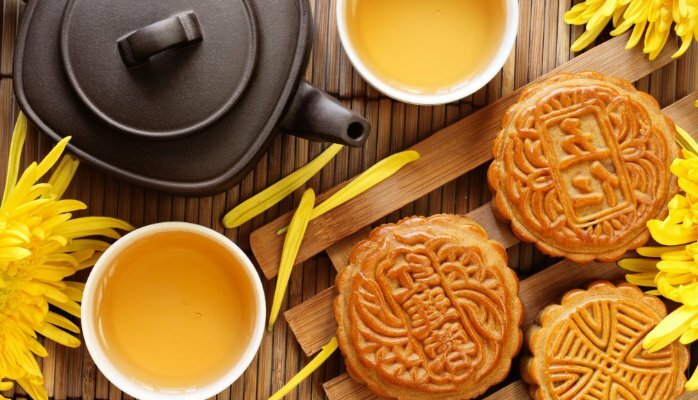 A single mooncake can contain as much as three bowls of rice and a day’s fat intake. 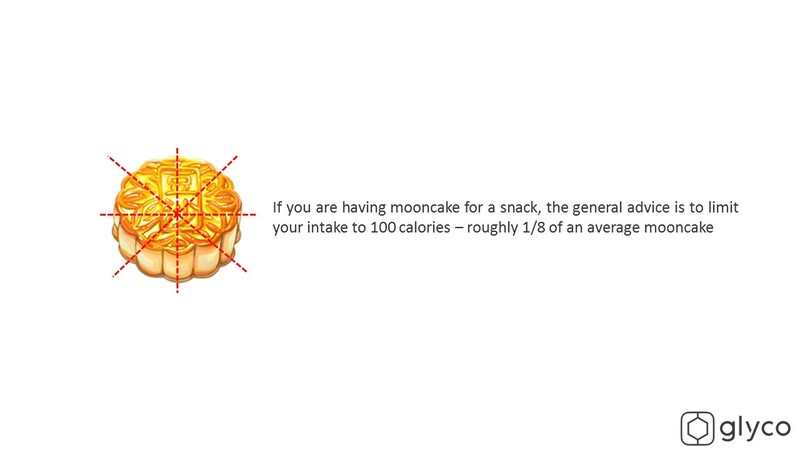 Therefore, if you are having mooncake for a snack, limit your intake to ⅛ of an average-sized mooncake. This is consuming about 100 calories. What Other Healthy Behaviours Can I Adopt This Festive Season? Remember, festivals can also be a time of staying physically active, not just eating. Exercise can improve energy levels, reduce stress and anxiety, as well as help you maintain a healthy body weight. So during a time when you may need it most, not just to mitigate some of the extra calories you may be eating but also to keep you in positive spirits, keep moving! Take a walk to enjoy the sights of decorative lantern sets at the Gardens by the Bay, and along the streets of New Bridge Road, Eu Tong Sen Street and South Bridge Road in Chinatown. May the glow of the moon surround you and light your way to health and happiness! Happy Mid-Autumn Festival! 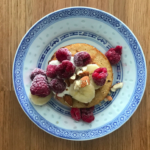 Previous Previous post: Healthy Breakfasts- 5 Great Ways To Start Your Day! 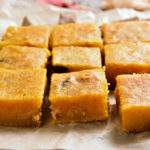 Baked Pumpkin Kueh Recipe that You’ll Go Kueh-Zy Over!